After winning the City of the Future for South-East Central Europe, the Serbian capital has won the second round of this prestigious competition. The award was presented to the mayor of Belgrade Mr. Nenad Bogdanović. 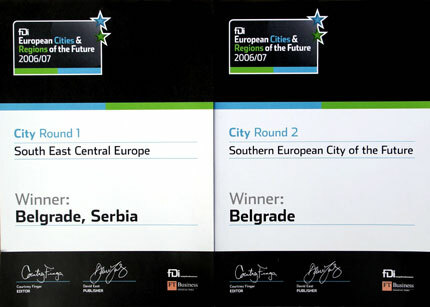 Financial Times has organized European cities and regions of the future for 2006/07 and, after winning the second round, Belgrade was awarded the name City of the future in Southern Europe. The award was received by Mr. Nenad Bogdanović, the mayor of Belgrade. He was accompanied by Ms. Vesna Perić, deputy Director of the Serbia Investment and Export Promotion Agency (SIEPA). SIEPA, together with the USAID’s project – SEDP has nominated Belgrade for this award. Our representatives were informed that the main competitor in this round was the Turkish city Manisa. The region of Southern Europe, where Belgrade is the City of the future, includes Slovenia, Croatia, Bosnia and Herzegovina, Macedonia, Albania, Bulgaria, Romania, Greece, Turkey and Mediterranean islands (Cyprus, Malta, Sicily, Crete, etc.). The awards were also given to London (City of the Future in Northern Europe), Paris (City of the Future in Western Europe), Brno (City of the Future in Central Europe), and Baku (City of the Future in Eastern Europe). These five cities are competing for the final award of being named the European city of the future for 2006/07. The competition for city and regions of the future is given on all continents and is organized by the specialized edition of the Financial Times for foreign and direct investments, FDI Magazine. The title carries a recommendation for the biggest future investment location, by the most recognized financial newspaper in the world. Categories and criteria by which the judges have made their decision are based on economic potential, cost effectiveness, human resources, IT and telecommunications, transport, quality of life and FDI promotion. The final winner of the "European city of the future for 2006/07" contest is London.